TechKno Camp teens visit Shure Incorporated! Shure Incorporated, the microphone manufacturer, is a proud sponsor of The MEMa Studio! They just happen to be based in Niles, IL, a suburb of Chicago. Our After School Matters, TechKno Camp teens went on a field trip to visit Shure and the staff couldn't have been more accommodating! The teens got to tour the entire facility and experience an anechoic chamber (photography wasn't allowed in some sections of the facility), an Rf chamber (where wireless microphones radio frequencies are tested) and the recording studio. They were also able to shoot a scene for their video project! 2015 Recap and Happy New Year! Please take a moment to read our Q1 Newsletter to keep up with our progress. We had an exhaustive but awesomely rewarding 2015... Check it out!! WGN TV News visited our site and reduced a segment about our program and the "Perpetrators" project, a short film depicting how violence on the South Side of Chicago affects their daily lives. 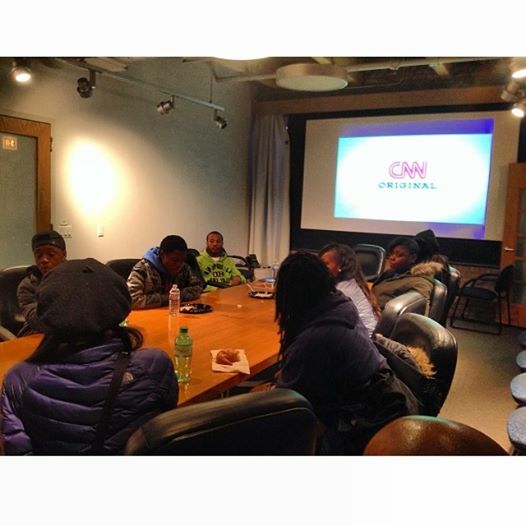 TechKno Camp teens visit CNN!! CNN is producing a Docu-Series titled "Chicagoland". In conversations with After School Matters, CNN asked for teens to attend a scereeing of the Doc with a short discussion afterwards. Out of literally thousands of programs ASM could've chosen, they chose our TechKno Camp teens... how awesome is that?!? Today was the first day of Afterschool Matters TechKno Camp collaboration. What an awesome and bright group of teens to work with. Check out our pics to see our new digs! The MEMa Studio reaches an agreement with After School Matters in Chicago to provide our TechKno Camp program to Chicago teens. Our after school program will run 3 days per week and 2 hours per day. We can't wait to get started!!! We'll have three Instructors involved in the training, covering specific entertainment production disciplines: Video Production, Music Production and Audio Production.